The Color of Pomegranates (1969) was perhaps the signal work of the gifted Armenian film artist Sergei Parajanov (born “Sarkis Parajanian”, 1924-1990). Parajanov had started off in 1951 in the Russian film industry directing films that followed the then-conventional (and even requisite) style of “Social Realism”. But after seeing his colleague Andrei Tarkovsky’s debut film Ivan’s Childhood (1962), he was inspired to defy convention and follow his own, unique aesthetic intuitions. Of course Parajanov’s interest in ethnography did not mean he would confine himself to a single culture. For Shadows of Forgotten Ancestors the cultural context was the Hutsul people of the Carpathian mountains in Western Ukraine, and for the subsequent The Color of Pomegranates it was his own Armenian culture. But what even more markedly differentiated those two films was their contrasting approaches to cinematography and mise-en-scene . Shadows of Forgotten Ancestors features incessantly restless camera work, as I have noted in my review of that film , such that the camera’s eye is almost an active participant in the narrative fragments presented. On the other hand, The Color of Pomegranates has a resolutely static camera, with the portrayed action playing essentially to the camera. In both of these cases, the camera aesthetics are major attention-grabbing elements of the viewer’s experience. The subject matter of The Color of Pomegranates concerns the life of the famed 18th century Armenian poet, musician, and troubadour, Harutyun Sayatyan (1712-1795), who was popularly known as Sayat-Nova, which means “King of Song”. Like Parajanov, Sayat-Nova was born in Tbilisi, Georgia, and had a varied life, which included (a) serving as a diplomat in the Georgian royal court, from which he was cast out for falling in love with the king’s sister; (b) then living the life of an itinerant troubadour; and (c) finally becoming an ordained priest in the Armenian Apostolic Church. Sayat-Nova died in 1795 when he was beheaded by the invading army of the Qajar Shah of Iran for refusing to convert to Islam. Not only was Sayat-Nova multi-talented in the performing arts, he was, like many Armenians, also multilingual – his songs were written in Armenian, Georgian, Azerbaijani Turkish, and Farsi (Persian). It is not surprising that Parajanov, who was also culturally multi-talented (he studied violin, voice, and ballet in his youth ), not only revered his fellow Tibilisian, Sayat-Nova, but probably also identified with him. 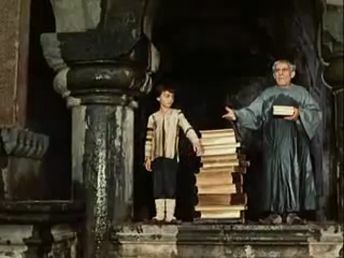 The Color of Pomegranates does not provide a clear-cut narrative recounting over any of this overt material about Sayat-Nova’s life, but instead offers imagery from what may be presumed to be elements of Sayat-Nova’s mental life, as reflected in his poetry and songs. The film comprises a sequence of titled sections comprising tableau vivants, each of which depicts in a dreamlike manner some Armenian cultural ritual associated with successive stages of Sayat-Nova’s life and that are performed to the accompaniment of Sayat-Nova’s songs. To a certain extent we could say that Parajanov seems to be inviting the viewer to wander around inside Sayat-Nova’s consciousness – or, since Parajanov probably identified with Sayat-Nova, the viewer is invited to wander around inside the dual Parajanov/Sayat-Nova consciousness – through the various stages of the poet’s life. 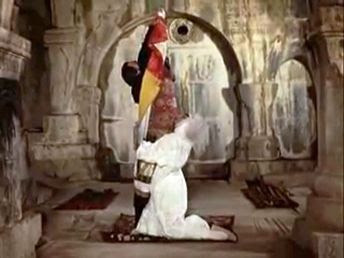 Note, however, that these tableau vivants in The Color of Pomegranates are different from the narrative fragments presented in Shadows of Forgotten Ancestors. Instead of being simply primitive narrative fragments, they are fully-fashioned reveries, almost set pieces in fact, that invoke the mysteries of Armenian cultural rituals. This is what makes them special and what makes the film special. It is true that many cultural rituals have a sort of primordial, dreamlike aspect to them – that is what makes them persist in our subconscious. Parajanov has managed to conjure up those dreamlike elements that seem to have an imaginative power beyond their literal presentation. 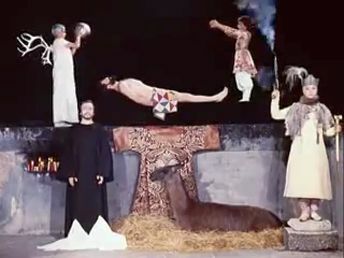 Although Parajanov referred to the limited resources he had available for the film’s production, there is no doubt that the finished product was well made. Mention should be made of the evocative music by Tigran Mansuryan and the contributions of cinematographer Suren Shakhbazyan. The visual style is fascinatingly austere. There is no camera movement and virtually no dialogue. The actors make slow formalized gestures and often look straight into the camera. Shots are often repeated, sometimes with very slight changes, which suggests the way our minds might revisit the memory of a movement or action in order to hold it in focus. Even more significant was the contribution made by cast member Sofiko Chiaureli. Her androgynous image sets a moody visual tone for the entire film, inasmuch as she plays six different roles, both male and female. In fact at one stage she plays both the poet (Sayat-Nova) and his lover, which underlies the sense of their mutual desire to be “one”. Then it proceeds through the titled sections. This section shows the Armenian reverence for the written word: “Without books the world would have witnessed nothing but ignorance.” There is also a tableau showing the poet as a young child peeking through a window at the goings on in an underground public bath. The images suggest that these were his first views of the naked female body. There is a sequence of back-and-forth images of the young poet and his beloved (both played by Sofiko Chiaureli!) offering their rings to each other. In this section there is a death that is mourned via traditional rituals. 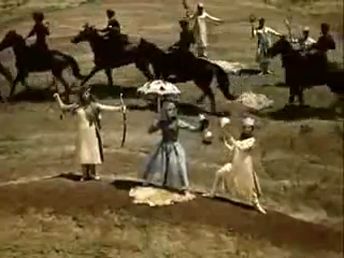 Three goats are ritually slaughtered using the same fixed camera setup in front of three different costumed witnesses. 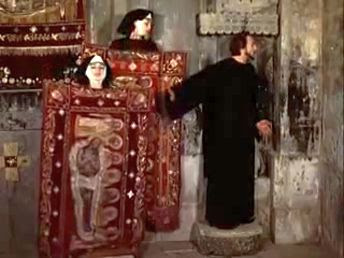 Then the monks participate in mourning the death of Father Lazarus Catholicos, an Armenian saint. The poet is involved in digging a grave in the center church floor, but while doing so, a flock of sheep are shepherded into the church and crowd his work. Then a woman in white (his lover) tries to embrace the poet, but he shields himself from her with an embroidered rug. Poet’s Dream (he returns to his childhood and mourns for his parents). The imagery returns to visions of the poet’s life as a child. There is a symbolic sequence showing the poet scooping his offering cup into a font at the church, but coming up empty. Meeting the Angel of Death. The Angel of Death arrives blindfolded and leading a sheep by a rope. A woman in white, presumably the poet’s beloved, is buried. The poet’s death is shown symbolically and, it seems, under the supervision of a woman who looks like his beloved but may be the Angel of Resurrection. All of these tableau vivants gave me not so much an understanding of Sayat-Nova’s life, but more an appreciation of the timeless Armenian religious culture. 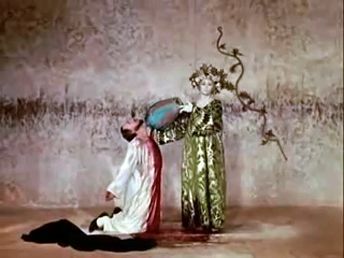 Perhaps for this reason The Color of Pomegranates was not well received by the secularism-obsessed Russian authorities. 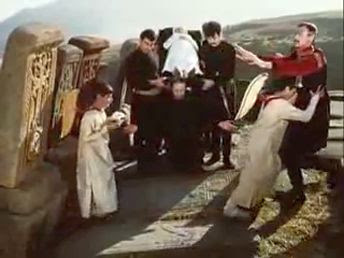 The government ordered a re-editing of the film that omitted some of the religious rituals and changed its name from “Sayat Nova” to “The Color of Pomegranates”. Parajanov was not allowed by the Russian government to make a feature film for the next fifteen years. 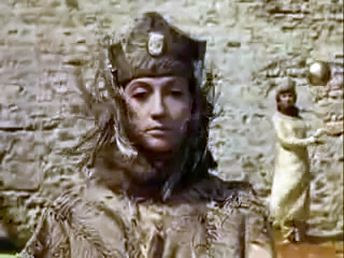 Even today after various attempted restorations of the film, it is unclear whether any extent copies fully represent Parajanov’s original final cut. Nevertheless, the film has been well-received by the worldwide critical community [e.g. 5,6,7,8], and it was ranked 84th on the British Film Institute’s 2012 poll of international film critics concerning the all-time greatest films . "The Color of Pomegranates by Parajanov, in my opinion one of the best contemporary film directors, strikes with its perfection of beauty. . . ."
Sergei Parajanov and Ron Holloway, “Sergei Parajanov Speaks Up”, (1 July 1988), Kinema, University of Waterloo, Fall 2015 issue. Dimitar Kutmanov, “The Cinema of Sergei Parajanov: An overview of his works and in-depth analysis of Shadows of Forgotten Ancestors”, Dimitar Kutmanov, (n.d.). The Film Sufi, “Shadows of Forgotten Ancestors”, The Film Sufi, (20 July 2016). D. Garrison Golubock, “Parajanov's Influence Still Spreading on 90th Anniversary”, The Moscow Times, (28 February 2014). Rahul Hamid, “The Colour of Pomegranates”, Cinémathèque Annotations on Film, Senses of Cinema, Issue 53, (December 2009). Tony Paley, “The Colour of Pomegranates: a chance to savour a poetic masterpiece”, The Guardian, (7 October 2014).